When you take a moment to think about it, it’s actually quite impressive that Batman has been in continuous publication for 80 years now. While most characters find their books cancelled and then revived a number of years later, the Dark Knight’s been going strong since first appearing in Detective Comics #27 back in 1939. In the decades to to follow, millions of people have developed some sort of idea of what “their” Batman is. Odds are the central, definitive archetype is tied to your first exposure to the character. For some, it could be Adam West’s version from the TV show which aired during the 1960’s, while others could favor Michael Keaton or Christian Bale from the silver screen adventures. During my travels, I’ve found that Kevin Conroy is often looked at as being the definitive Caped Crusader because his voice has been omnipresent in our heads for so long. In fact, his debut on Batman: The Animated Series came not long after the character’s 50th anniversary, and Conroy has since gone on to voice the World’s Greatest Detective in other shows such as Justice League Unlimited, not to mention branching out into animated movies and video games. Actually, I find it quite fitting that multiple interpretations of Batman be included here because, again, it speaks to how long he’s endured and how many creators and filmmakers have put their own stamp on him. 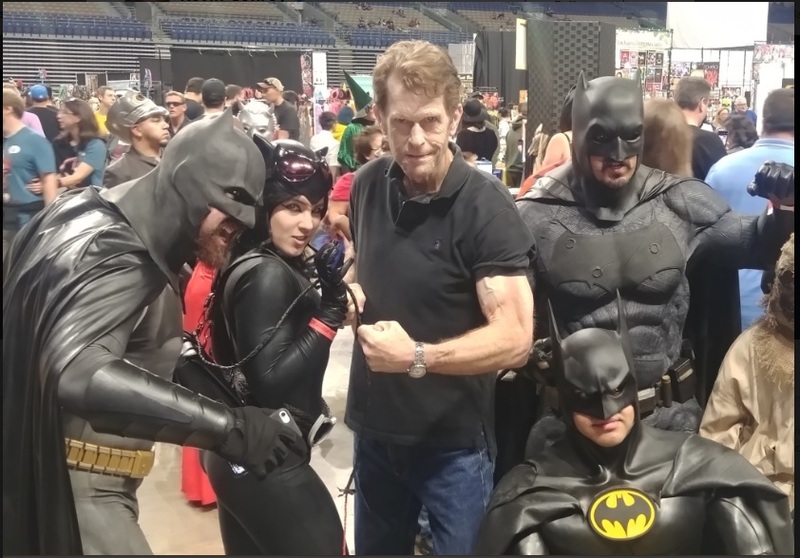 As you can see, the cosplayers posing with Kevin are paying tribute to Michael Keaton and Ben Affleck, though one is turned to the side, so I can’t tell if he’s also of the Affleck variety, or the New 52 version. But hey, at least Catwoman is also there, and Scarecrow is hanging out at the edge of the frame. If you’d like to do your part in celebrating 80 years of Batman, then it’s recommended that you venture to your local comic shop today and pick up a copy of Detective Comics #1000. Then, be sure to come back here and read our review.